I've played with Hazel in years past, but never looked at it too seriously. It's definitely a powerful tool! But I found one aspect of the utility very unintuitive. For extra nerdy Mac nerds, this may be either underwhelming or very obvious. I was looking for an a solution for a coworker yesterday, who had a fairly simple issue. She has her pictures folder filled with subfolders. These sub-folders have more sub-folders or images (Picasa puts the folders there). She simply wanted her Pictures folder to be filled with images, no folders. She was hoping for some kind of automated solution to move all the images into one location, minus all the subfolders. My answer: Hazel should take care of that, no problem. And it did. But getting there was less intuitive than I expected. The problem was this: no where could I find an explanation that when you choose to create rules for a given folder, you have to first specify that your rule(s) be applied to the contents of the folder. In my head, I had this assumption that this was implicit and did not need to be specified. 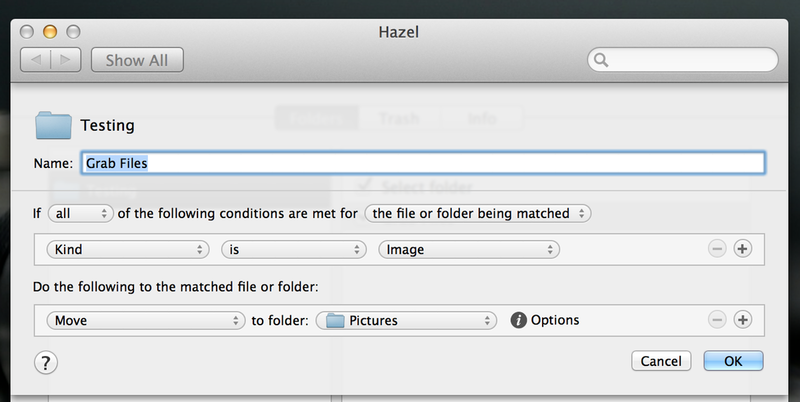 I get it now — you may want to act on the folder itself, not its contents, so it has be explicitly set. But it took a good bit of testing (and a little guidance from Garrett St John) before I had the solution. I looked through many a blog post, from authors such as David Sparks, Shawn Blanc and Ben Brooks, but never found any mention of this. Same for the Noodlesoft site (not the best source of documentation!). I realize this could simply because it's obvious to most folks and I'm just a little dense. But in the event that others have been tried out this tool and been confused, I thought I would share this tip. If you want to have rules that apply to the contents of a folder, you must add this rule at the top of your list of rules.